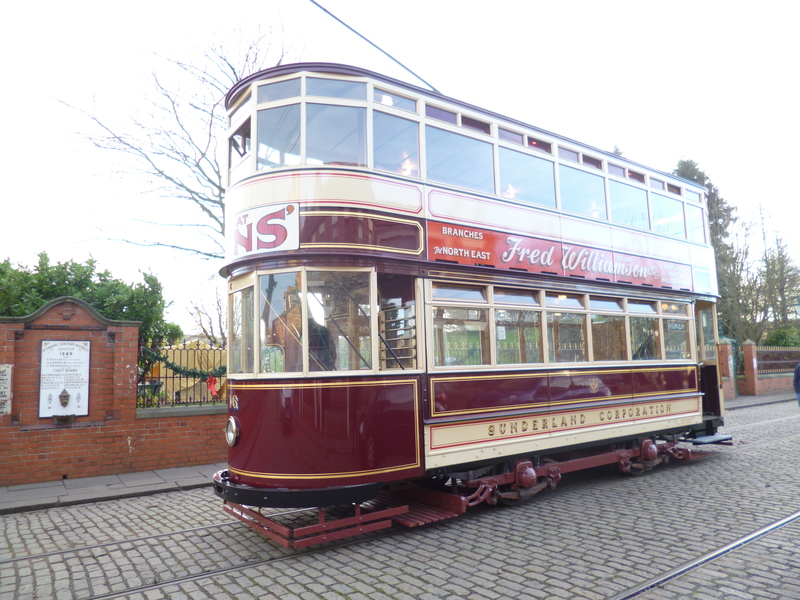 Below: Rambler has once again rejoined our working fleet after some two years out of action. 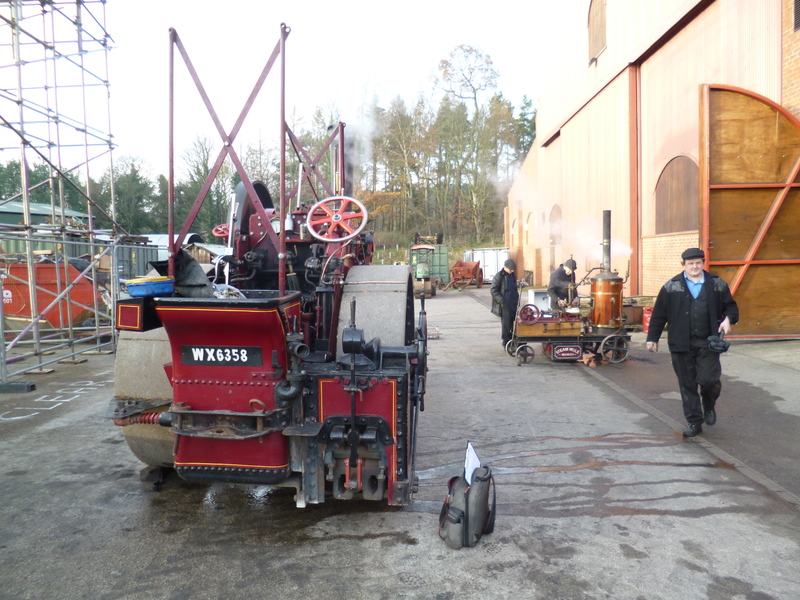 Along with the Steam Mule, both were steam tested last week by the RSA surveyor, following a hydraulic test in the autumn. Both have been re-tubed with Rambler also seeing extensive work to the front tubeplate and repairs to grooving in the firebox. 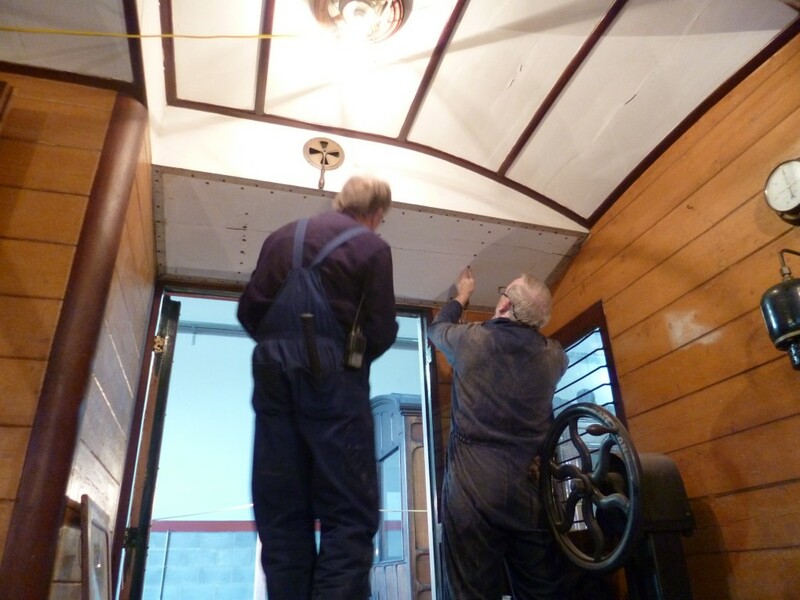 At the same time a new chimney base was fitted to replace the fractured original (which had lasted through welded first aid) and a new smokebox door ring and door also manufactured. The original had a huge hole in and it was always a wonder that it steamed as well as it did! Both roller and portable are seen here during their steam tests. 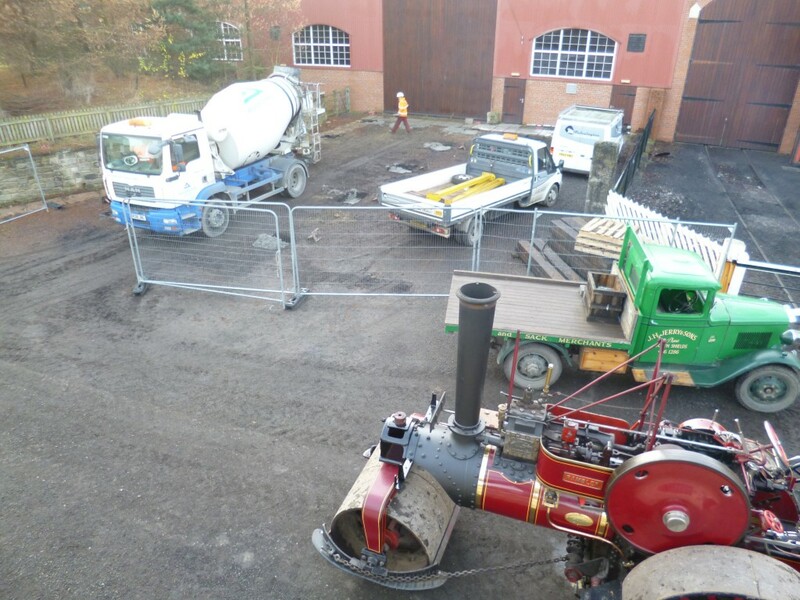 Below: The concrete has been poured for the foundation blocks of the roller shed, part of a new roadmaking exhibit that will open next year. The building is largely recovered from components we had on site, but will feature new cladding. 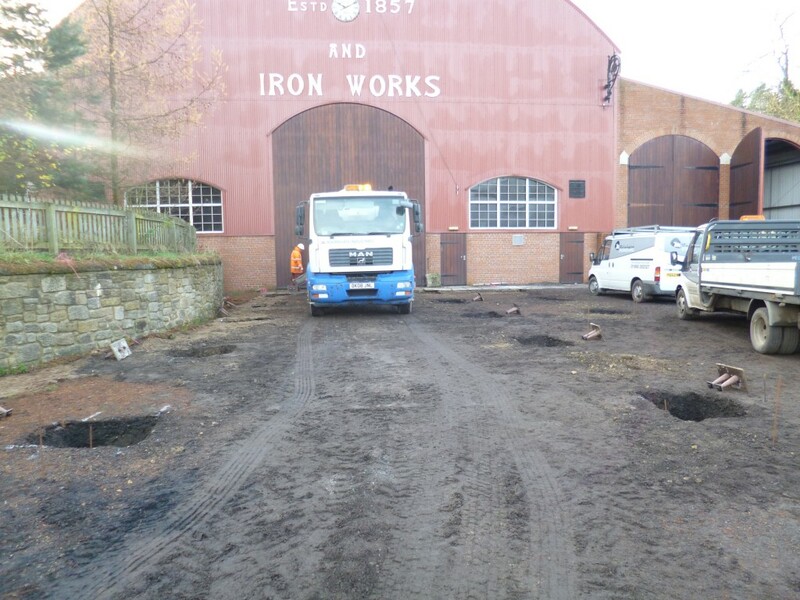 It will be the operating base for our roller fleet as well as housing other appropriate road-related artefacts. Below: Work continues on 58A, which has had the first coats of silver primer applied to seal the wood against winter dampness. 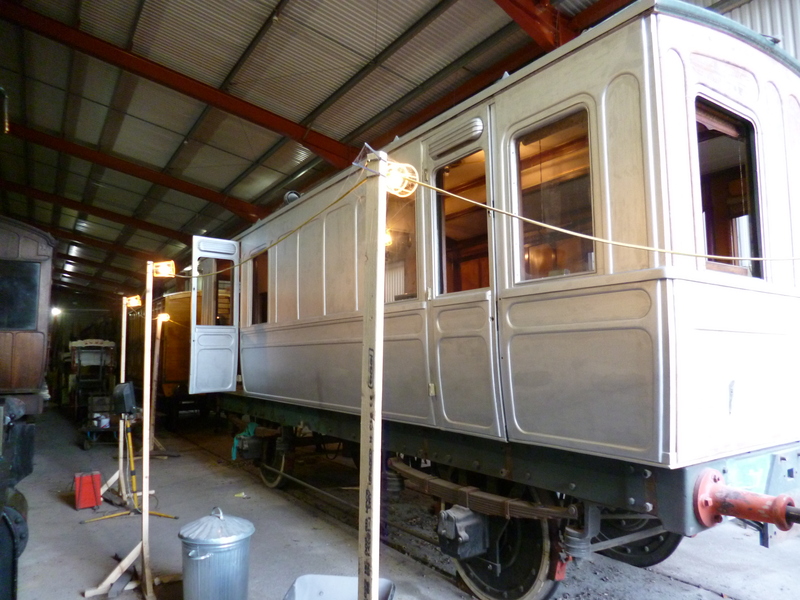 No further painting will take place until next year and some warmer weather, though the underframe and interior work will continue. 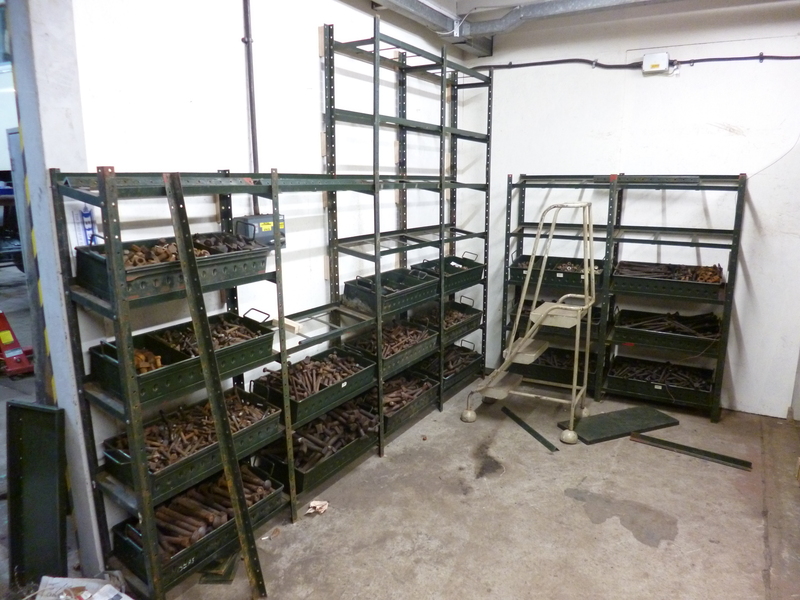 In due course we hope to enclose and insulate a section of this shed to allow for all-year painting as well as warm storage of working locomotives – something for next year though. 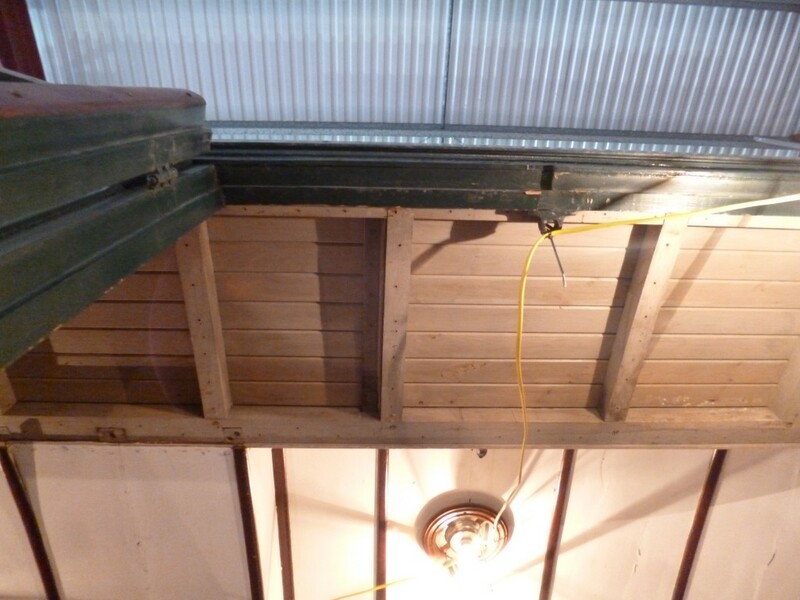 The interior roof panels of the guards compartment have also been removed and will be replaced as they were badly cracked. They can be used, in cut down form, on Sheffield 264 as this requires some of its teak panels patching and this recovered wood is the very same material… Not often you get lucky like that! Below: Here is a short film of 16 on text – the sound isn’t too distinct but it provides an interesting view of the site in heavy rain as 16 sees the World! 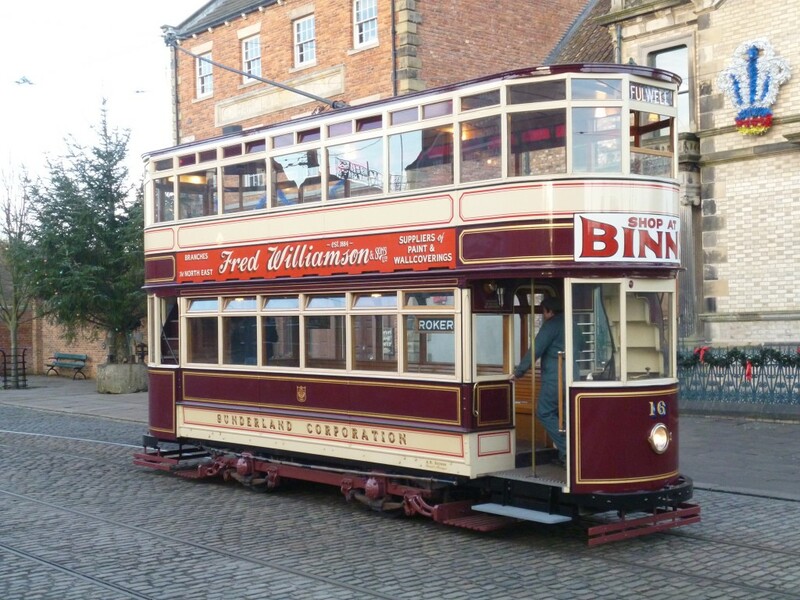 As the demands of the operation grow, and more staff are based around the Museum, the fleet of vintage vehicles to be used on daily duties has recently increased by three. 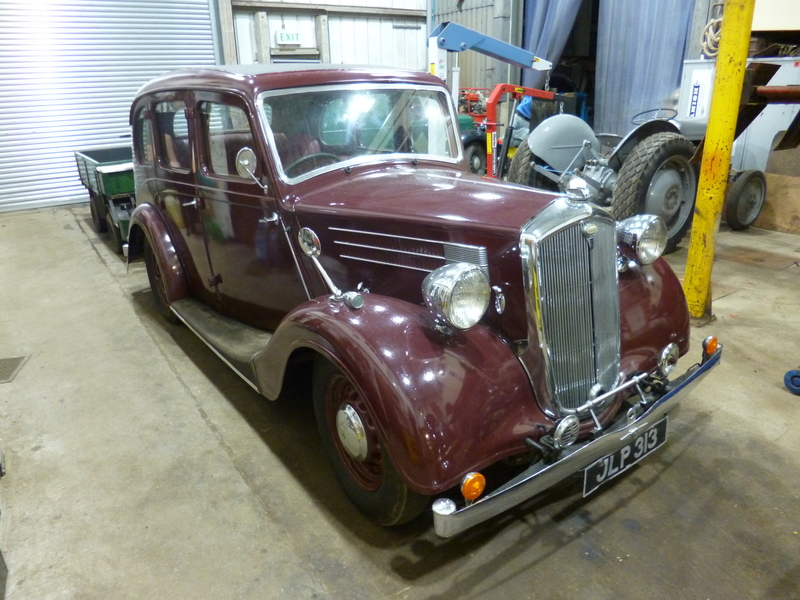 Below: And this Wolseley will join the Town car pool (with the Austin 10 and eventually the Ford Popular). Fuller details on each in due course. 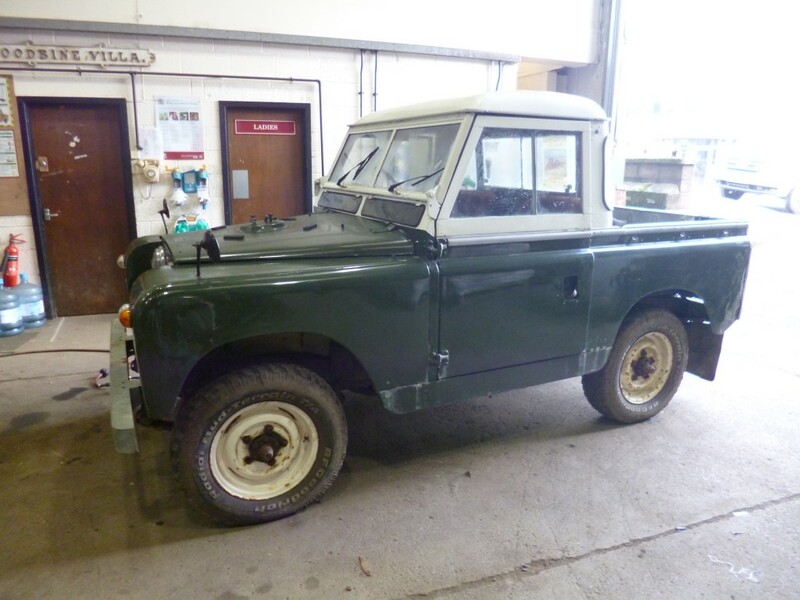 They are very much for use on site and as such aren’t accessioned exhibits. 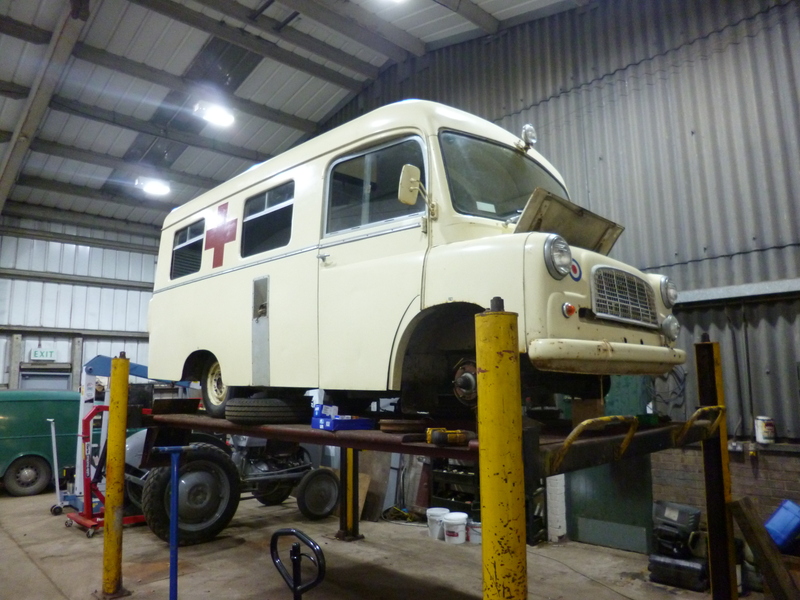 We are also looking for one further van for the food team – preferably pre 1960s (as the Bedford and Landrover are stretching the timeline a bit but had to be usable in daily service on and off the site). 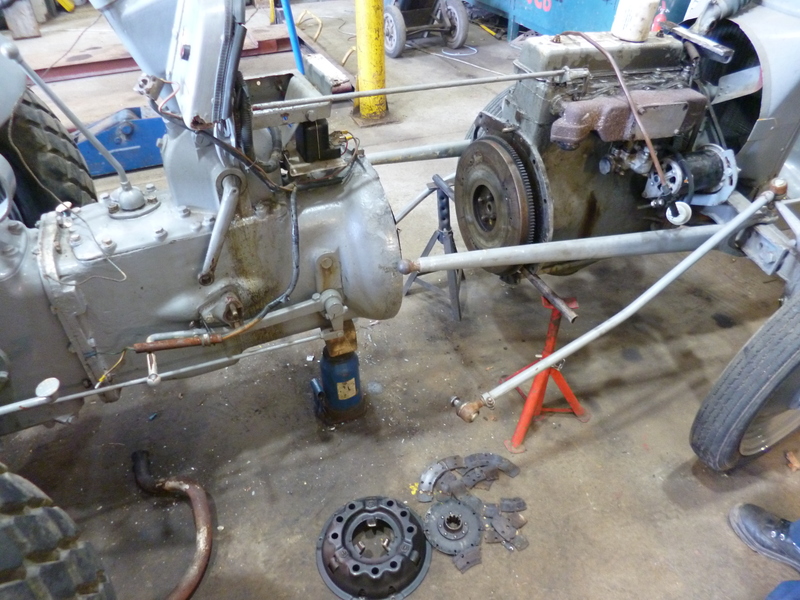 Below: One of the Fergie’s has been in for attention – culminating in a new clutch being fitted which entails splitting the tractor to access the clutch housing as seen here – note the disintegrated remains of the old clutch plate on the floor in the foreground! 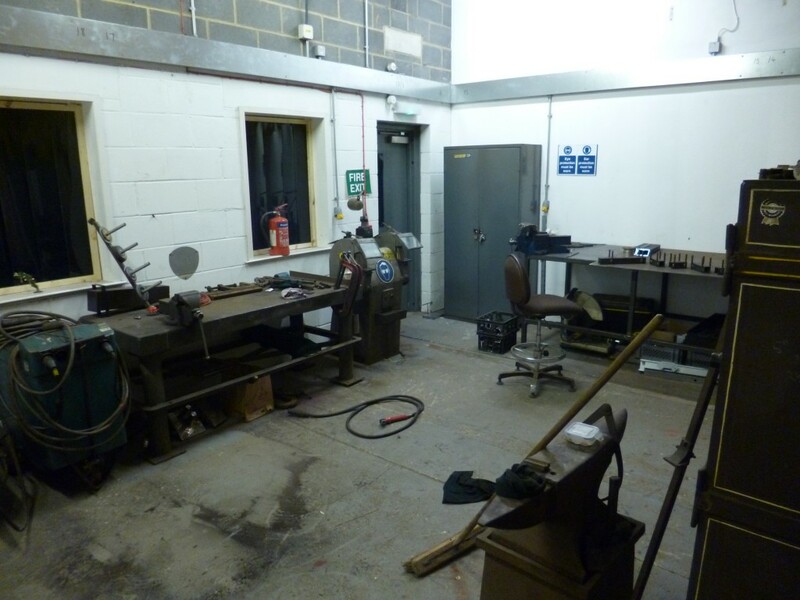 Below: A couple of views showing the RHEC moves – first the new welding bay being prepared (extraction still to install) and secondly the rearranged bolt store – usually only bolts and no nuts to match, but vital to our daily as well as restoration work all the same. Great Video of 16. Very useful indeed Paul you obviously knew I’d spent part of today working on a 4mm scale one for Gordon and had a few questions to research! I need a broadside photo in decent weather of the new Advert for that as well. Tell us when she’s in daytime service please? I got a surprise when volunteering as 16 was in service today (Wednesday) and I got some side and end on photos while it was parked outside the depot this afternoon. Hi Paul, I dropped you an email regarding your search for a van – let me know if you didn’t receive it. Paul,in order to complete the model of 16 can you please confirm the colour of the roof? Number 16 what a fine ride, appears very smooth .Appears a superb example of cooperation and skills.